Stanford researchers demonstrate the first step in a scalable quantum cryptography system that could lead to uncrackable telecommunications. Quantum mechanics offers the potential to create absolutely secure telecommunications networks by harnessing a fundamental phenomenon of quantum particles. Now, a team of Stanford physicists has demonstrated a crucial first step in creating a quantum telecommunications device that could be built and implemented using existing infrastructure. Quantum cryptography relies on the curious aspect of quantum mechanics by which pairs of electrons can become "entangled." Electrons have a property called "spin": Just as a bar magnet can point up or down, so too can the spin of an electron. When electrons become entangled, their spins mirror each other. If the spin of electron A is found to be pointing "up," then electron B's spin will also point up. If electron A's spin measures "down," so too would electron B's. An amazing feature of entangled electrons is that this pairing persists no matter the distance between electron A and electron B. This behavior can be applied to create a perfectly secure communications network, which is of great interest to governments as well as members of private industry, such as banks. If one has a set of electrons in San Francisco and another set in New York, and the electrons can be made to be entangled, then it is possible to distribute cryptographic keys – strings of 1s and 0s, in which the different electron spin directions correspond to either 1 or 0 – between San Francisco and New York. The nature of quantum entanglement means it would be impossible for an eavesdropper to intercept the keys without the original parties noticing. The work done by the Stanford research group of Yoshihisa Yamamoto, a professor of applied physics and of electrical engineering, in collaboration with the group of applied physics Professor Martin Fejer, provides a solution to one of the key wrinkles of quantum telecommunications. In the example above, the electrons are thousands of miles apart, so they can't be directly entangled; instead, they become entangled by sending photons between the two over fiber optic cables. In this case, the San Francisco-based sender would coax its electron to emit a photon, which would itself be entangled to the electron. The New York-based recipient's electron would also emit an entangled photon, and when the two photons interact, the electrons on either end would then become entangled and share the same quantum spin. A challenge is that light "leaks" from even the best fiber optic cables; current systems employ multiple devices called "repeaters" that receive a fading light signal and then amplify and reproduce it to send to the end recipient. In order to transmit quantum messages, scientists need to build "quantum repeater" systems that enable entanglement between electrons to be created over many repeater stations between the start and end locations. Quantum telecommunication networks such as this are still years away, but the new Stanford research – published this week in Nature, with recent PhD graduate Kristiaan De Greve as lead author – demonstrates a critical first step in that chain. Other researchers have entangled an electron and photon and created a memory using the electron, but those efforts required complex systems that are bulky and difficult to duplicate. 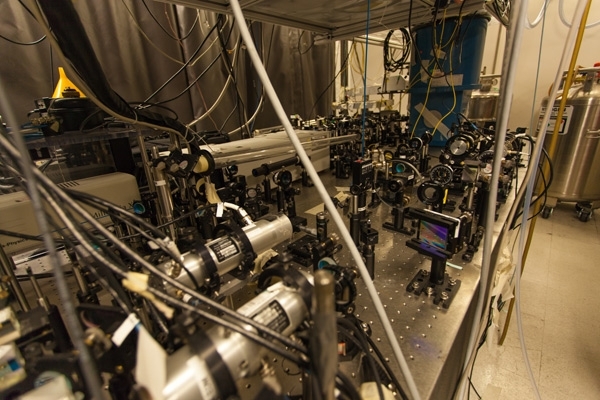 The new approach, however, is potentially easier to scale up to systems that have many entangled pairs of electrons, said one of the study co-authors, Peter McMahon, an electrical engineering PhD candidate at Stanford. The Stanford group used a quantum dot array – provided by collaborators at the University of Würzburg in Germany – that sits on a postage stamp-size semiconductor chip that contains a layer that is covered with millions of tiny bubbles, or dots. Each of these so-called quantum dots contains a single electron; in essence, each quantum dot is an artificial atom. By focusing a laser on a single dot, the researchers excited the electron inside and caused it to emit a photon. Tests showed that the emitted photon's orientation corresponded to the electron's spin direction, confirming that the photon and electron were quantum entangled. An advantage of quantum dot arrays is that they could be produced using standard semiconductor-manufacturing technology. A single chip could contain millions of dots, arranged in a regular grid layout that would allow for the generation of long keys at high speeds. Another experimental first achieved by the Stanford group is that the photon entangled with the electron is produced at the optimal frequency for transmission along fiber optic cables. The ability to slide into existing telecommunications networks and the ease of manufacture make Stanford's approach particularly appealing for future research, McMahon said. The next step will involve building a receiver and confirming that electrons on both ends become entangled. And though that work could take several years, McMahon and his colleagues are optimistic. "We have demonstrated a fundamental building block of a quantum repeater node," he said. "It should not be impossible to create the second link." The paper by Kristiaan De Greve and co-contributors Leo Yu, Peter McMahon, Jason Pelc et al. appears in Nature, Vol. 491. The work was done in collaboration with researchers from the University of Würzburg and Heriot-Watt University. The work was supported by the Japan Society for the Promotion of Science, the National Science Foundation, the National Institute of Information and Communications Technology, the National Institute of Standards and Technology, Special Coordination Funds for Promoting Science and Technology, and the State of Bavaria. Funding also came from the Herb and Jane Dwight Stanford Graduate Fellowship, a David Cheriton Stanford Graduate Fellowship and a Robert N. Noyce Stanford Graduate Fellowship.